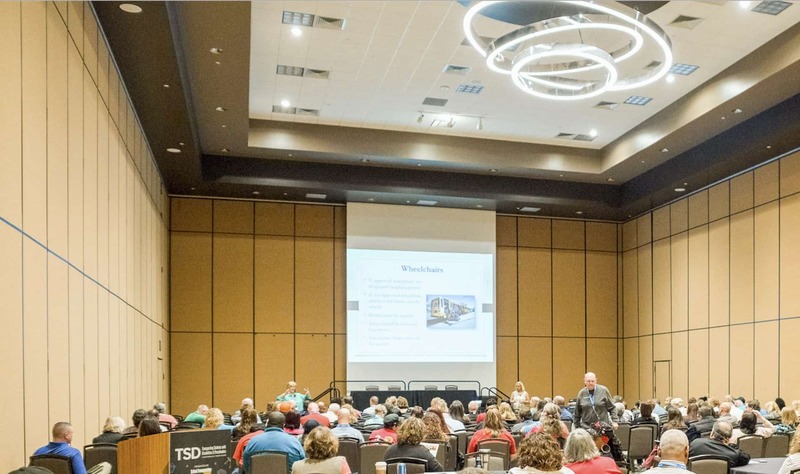 The Transporting Students with Disabilities & Special Needs Conference & Trade Show is fast approaching, and final preparations are underway for the March 15-20 event at the Embassy Suites Dallas-Frisco Hotel Convention Center & Spa. This training session, which is approved by the National Highway Traffic Safety Administration, teaches the proper securement of pre-school aged children in appropriate child safety restraint systems (CSRS) on school bus seats. It provides the basic rules of proper CSRS usage, and illustrates the most common mistakes made when installing CSRS in school buses. Continuing education units (5.5 CEUs) are approved by Safe Kids Worldwide for all registered attendees who complete the course work. INSTRUCTORS: Kathy Anneken of Easy Way Safety Services; Fred Doelker of Dean Transportation; Denise Donaldson of Safe Ride News; Sue Shutrump of Trumbull County (Ohio) ESC; and Charles Vits of IMMI/SafeGuard. Emergency evacuation training is designed to train drivers and bus monitors in the proper way to plan, practice and conduct an emergency evacuation of a school bus. INSTRUCTORS: Maria Carroci of the Pupil Transportation Safety Institute. IDEA identifies 13 categories of disabilities that are frequently diagnosed for the students riding your buses. This four-hour workshop will provide the detailed information to assist the transporter in connecting the behaviors to the disability, to facilitate the ability to anticipate common challenges. Strategies will be discussed in detail during this hands-on workshop, to fill your behavior management tool box with some effective techniques. Bring your most challenging behaviors to use in group brainstorming sessions during the workshop. Walk away with practical and effective ideas to solve your toughest issues. INSTRUCTOR: Betty Hughes of the Pupil Transportation Safety Institute. BESI, Inc. representatives will teach proper child passenger securement in school buses. This class is a refresher class for TSD Roadeo contestants, as well as main conference attendees. Q’Straint/Sure-Lok representatives will teach proper securement of wheelchairs in school buses. This class is a refresher class for TSD Roadeo contestants, as well as main conference attendees.